Globus Connect is easy-to-install, pre-configured software that turns your laptop, server, cluster or other local resource into a Globus endpoint. There are two versions of Globus Connect, one for use with personal machines such as your laptop, and another for use with server-class machines such as campus computing clusters and lab servers. Use Globus Connect Personal to enable file transfer to and from your personal machine (laptop or desktop.) A Globus Connect Personal endpoint is intended to be used only by a single user. Globus Connect Server enables system administrators to turn shared resources such as campus clusters and lab servers into a Globus endpoint. If it is made publicly visible, a Globus Connect Server endpoint can be used by multiple Globus users. What is the difference between Globus Connect Personal and Globus Connect Server? Globus Connect Personal is used to create an endpoint on a single-user system, e.g. on a laptop or a personal desktop machine. We sometimes refer to this as a "personal endpoint". Globus Connect Server is used to create an endpoint on a multi-user system, e.g. on a campus HPC cluster or a lab server. We sometimes refer to this as a "server endpoint". See the links below for instructions on creating personal and server endpoints. An "endpoint" is one of the two file transfer locations – either the source or the destination – between which files can move. Once a resource (server, cluster, storage system, laptop, or other system) is defined as an endpoint, it will be available to authorized users who can transfer files to or from this endpoint. Globus endpoints are named using the following format: <globus-username><endpoint-name>#. For example, the XSEDE project has a Globus account under the username "xsede" and so it’s endpoints are named xsede#stampede (for the Stampede system at Texas Advanced Computing Center) and xsede#kraken (for the Kraken system at the National Institute for Computational Sciences). Likewise, an individual that has a Globus account under the username "maxim" might have a personal endpoint called maxim#mylaptop. How can I create an endpoint? If you wish to create an endpoint on a personal machine (laptop, personal desktop computer, etc.) please see the instuctions for setting up a Globus Connect Personal endpoint here: Mac OS X, Windows, Linux. If you are setting up an endpoint on a multi-user machine (e.g. HPC cluster, lab server, etc.) please follow the instructions in the Globus Connect Server Installation Guide. If you already have a GridFTP server running on your machine you can use the Endpoints webpage to add an endpoint that refers to that GridFTP server. The globus endpoint create command on the Globus command line interface can also be used to add an endpoint. How do I create an endpoint on Amazon S3? Instructions for setting up an S3 endpoint are available here. Please note that S3 endpoints require a Globus subscription - if you’re not a current Globus subscriber, please complete this form to start your free one-month trial, which will allow you to experiment with and test all Globus premium features. Are transfers between Globus Connect Personal endpoints possible? Yes. 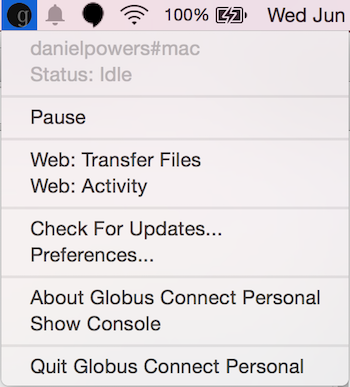 You must be a Globus Plus user to transfer files between two Globus Connect Personal endpoints. If the two endpoints are owned by different Globus users, both users must be Globus Plus users. You account may be upgraded to Globus Plus if your institution subscribes to a Globus subscription. Note:You do not need to be a Plus user to transfer files between a Globus Connect Personal endpoint (e.g. on your laptop) and a Globus Connect Server endpoint (e.g. on your lab server or campus cluster). Globus Connect Personal can execute a transfer as long as either the source or destination endpoint has a routable IP address (which is the case for almost all Globus Connect Server endpoints). How do I specify paths on Globus Connect Personal running on Windows? Globus Connect Personal on Windows will translate a path beginning with /~/ into your home directory, e.g. C:\Users\Anatoly\. To access paths and drives outside of your home directory, use the syntax /drive_letter/path, for example /C/xinfo lists the C:\xinfo directory. Where does Globus Connect Personal store its settings? How do I get a new setup key for a reinstallation of Globus Connect Personal? Install Globus Connect from scratch: Mac OS X, Windows, Linux. Then, Click "Generate Setup Key". Return to the "Initial Setup" window of Globus Connect Personal and paste the setup key into the provided field. The "OK" button will be enabled if the key is valid. Click "OK" to complete the installation. (If the "OK" button is not enabled, please ensure you have properly copied the entire key generated in the previous step above. Please note the ports that Globus Connect Personal needs open: Globus Connect Personal uses only outbound TCP connections; port 2223 is used for communicating with the Globus service, and ports and 50000-51000 are used when doing a transfer. What is the purpose of the Globus Connect Personal setup key? The setup key is a one-time credential used during the Globus Connect Personal installation process to uniquely identify your laptop/personal computer’s endpoint to Globus. Once the endpoint is created and the installation is complete the key is discarded. Does Globus recognize a USB external drive on my laptop as part of an endpoint? Open the Globus Connect Personal settings window to add your USB drive. On Mac OS X, click "Preferences" in the Globus Connect Personal menu. On Windows, select the Tools → Options menu option. On Linux, select the File → Preferences menu option. Click on the "+" button and select your USB drive. Optionally, change the directory path that you would like to access. Now, when you access your Globus Connect Personal endpoint on the Start Transfer page, you can change the path to the name of your USB drive to browse/transfer files. How does Globus Connect Personal work? The Globus service manages transfers to and from a Globus Connect Personal endpoint. Globus Connect Personal uses GSI SSH to maintain a control connection to the Globus service and receive commands. Data are always transferred directly between the Globus Connect Personal endpoint and the destination endpoint – data does not "flow through" Globus in any way. How Do I Configure Accessible Directories on Globus Connect Personal for Linux? When using Globus Connect Personal, you will only be able to transfer files to and from directories on your local computer that are set to be accessible. To configure which directories are accessible to Globus Connect Personal, you must configure the ~/.globusonline/lta/config-paths file. This file is a plain text file, with each line corresponding to the configuration of a particular directory path you wish to make accessible. Each line consists of 3 comma separated fields. The first field is an absolute directory/path to be permitted. A leading tilde "~" can be used to represent the home directory of the user that runs globusconnectpersonal. The second field controls sharing, with a value of "1" allowing sharing for the path and a value of "0" disallowing sharing for the path. Note:Sharing is a premium feature, so the endpoint must be covered by a subscription to use sharing. For additional details, see here. The third field determines whether the path will be accessible read-only or read/write, with a "1" permitting read/write access and a "0" marking the path as read-only. The permissions set by this field are in addition to any other permissions/restrictions that may already be in place on the host - e.g. Linux file system permissions, etc. - and the most restrictive of all applicable permissions are what will determine effective access. For additional details, see here. In all cases, it is important to note that a user cannot access a directory or a file via Globus Connect Personal that they don’t have proper unix file permissions for on the local system. Unix file permissions must be considered along with the permissions specified in the config-paths file to determine actual accessibility for a given file or directory. In any case, the most restrictive of the two categories of permissions will always apply. Note:There are some caveats concerning how Globus Connect Personal handles symlinks found in accessible paths. Please read more about that in the following FAQ: How Does Globus Handle Symlinks? 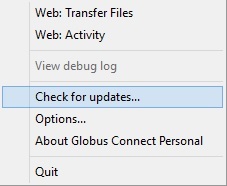 How do I update to the latest version of Globus Connect Personal? The steps you will need to take to upgrade your current Globus Connect Personal install will depend on the operating system you are using. Please refer to the section below that corresponds to the OS of the system that you have Globus Connect Personal installed on. If you should encounter problems when attempting your upgrade and cannot resolve them, then feel free to contact support@globus.org for help. What can I do if my endpoint does not support timestamp preservation? In the event that you see an error like this - Message: This server version does not support timestamp preservation, follow the steps below. Cancel your job and restart it without the timestamp preservation option. Note:If you require timestamp preservation, please contact the administrator of your endpoint and request that they upgrade the GridFTP server to 5.0.5 or 5.2.1 (or later versions). Why can’t I connect to relay.globusonline.org? ssh: connect to host relay.globusonline.org port 2223: A connection attempt failed because the connected party did not properly respond after a period of time, or established connection failed because connected host has failed to respond. These errors indicate that you are having trouble reaching Globus through your network. Throughout this article, we will use the common notation of relay.globusonline.org:2223 to refer to port 2223 on the server relay.globusonline.org. To confirm that you are unable to reach our server, and that the Globus Connect Personal is not suffering from some other error that it cannot distinguish, you can use the telnet tool to test your ability to connect to relay.globusonline.org. You may then exit the telnet program by typing Ctrl+] and closing the terminal. This confirms that you are able to connect to our server, even though Globus Connect Personal reports that it is unable to do so. At this stage, we recommend opening a support ticket. if this is the case, you are not able to connect to the Globus service, and the error reported by Globus Connect Personal is accurate. A failure to connect to relay.globusonline.org:2223 most commonly indicates the presence of firewall rules that restrict access to a specific set of ports. This most often arises on a publicly accessible network like a University or Hospital network. Firewall rules restrict connections on specific port numbers in order to protect users on the network. Unfortunately, the ports used by Globus are not among the standard set used for connections to webservers or for remote logins, so they are typically not listed as being allowed. You can confirm that this is the problem by attempting to run Globus Connect Personal from a home network or other location that does not have these firewall rules in place. If you are able to use Globus Connect Personal from another network successfully, it means that it is almost certainly a matter of firewall restrictions on the network that you are attempting to use. If you have confirmed that there are firewall rules or similar restrictions preventing you from reaching Globus, you will need to contact your network administrators to have these restrictions lifted or exceptions added. It is worth noting that the data ports 50000-51000 can be altered to other values, although these defaults are the common case. If the endpoint that you are attempting to transfer with has specified a different port range, you will need to obtain that set of ports from the endpoint’s administrator. Some network administrators maintain automated systems or sets of forms that can be submitted in order to request firewall exceptions. If you able to find these resources, it may greatly expedite this process. A very common source of trouble for Globus Connect Personal Linux users is a restrictive configuration of the iptables firewall rules. We will not provide a guide to reading and editing iptables here, but if you are comfortable adding, removing, and modifying rules in iptables, you may want to attempt to troubleshoot the problem yourself. Simply make sure that inbound and outbound TCP connections are allowed on ports 50000-51000, and outbound connections are allowed on port 2223. It is possible to configure an endpoint to use UDT for file transfers. If you are performing transfers with an endpoint that uses UDP, you must ensure that the data ports 50000-51000 are accessible over UDP as well as (or instead of) TCP. If you are unable to resolve the problem yourself, or have confirmed that there are no firewall restrictions preventing your Globus Connect Personal endpoint from reaching Globus, please open a support ticket with us. A member of our team will contact you as soon as possible to help you get your Globus Connect Personal endpoint working. We always attempt to provide quick response time, but the more information you provide, the more likely we will be able to resolve your issue promptly, and the less likely you are to be asked to provide more information before your problem can be solved. What happens if my user profile is on a network share? "Your user profile is on a network share, at location "<path>". To use Globus Connect Personal, you must map this location to a local drive. Please contact support@globus.org for more information." This issue arises when your home directory is stored on a server, and "<path>" takes the form of "\\example.com\share\Users\ExampleUsername". To resolve this problem, you must use Windows' capability to create a shortcut to a network share, or "Map" it to a drive letter. Microsoft provides official documentation for this here. Follow these instructions to assign a drive letter of your choosing to the network share containing your home directory, and then restart Globus Connect Personal. Why do I get "Permission Denied" or "Path not allowed" errors on my endpoint? The administrator of the directory you have selected does not permit you to view its contents; and the directory may not be transferrable. Command Failed: Error (list) Server: username#endpointname (Globus Connect) Command: MLST /directory/ Message: Fatal FTP Response --- 500 Command failed : Path not allowed. 500 Command failed : Path not allowed. Option 1: The Folder Is Not In Your "Accessible Folders", "Accessible Directories and Files", or "Access Path Configuration"
Depending on your operating system, this setting may be called by any of the above names. The Accessible Folders is Globus Connect Personal’s list of files and directories to which you have granted Globus access. This is the more common cause of this error. The Accessible Folders must include a folder that contains the file or folder you are attempting to transfer. If you have the file or folder entered into your Accessible Folders settings, and are still receiving permission denied errors, it is likely that your user account on the endpoint does not have sufficient privileges on the file or folder that you are attempting to access with Globus. To resolve this issue, you may need to modify your Accessible Folders on Globus Connect Personal. If you are using Windows, go to the System Tray, and right-click on the Globus icon. Select "Options" to bring up the menu, and select the "Access" tab. If you are using Linux, go to the File menu and select "Preferences". If you are using OS X, go to the Taskbar, and left-click on the Globus icon. Select "Preferences", and then select the "Access" tab. Any folder name in the Accessible Folders list may have its contents read—that is, inspected or copied—by Globus. There are additional checkboxes to make the file or folder Writable —may be modified, replaced, or deleted—and Sharable —accessible from Shared Endpoints you might create (note: you must be a Globus Plus user to share from a Globus Connect Personal endpoint). Add your file or folder, or a folder which contains your file or folder, and make it Writable if desired, and you should no longer see "Permission Denied" errors. For example, if exampleuser wants to transfer file /a/b/c from Globus Connect Personal endpoint exampleuser#myendpoint to exampleuser#otherendpoint, all he or she has to do is open the Accessible Folders settings on exampleuser#myendpoint, and ensure that one or more of the following files or directories are in the Accessible Folders list: /a/b/c, /a/b/, /a/, or /. If you do not have sufficient permissions to read or write a file or folder, you will need to change the permissions on those files or directories so that Globus can access them. Once you can view or edit files or directories under your user account on the Globus Connect Personal endpoint, Globus should no longer have problems reading or writing their contents, as long as the Accessible Folders settings are correct. Can I force encryption on an endpoint? All transfers to/from that endpoint will use encryption, whether submitted from the CLI or the Web, even though the user will not see that option checked in the Web. Please note that setting this option will cause transfers to fail if the client doesn’t request an authenticated and encrypted data channel. Why do I get an SSLv3 handshake error? If you see the above error it indicates that your endpoint is still using an old/incompatible version of the Globus Connect software. We updated our infrastructure to disallow SSLv3 (and prefer TLS) to avoid the POODLE vulnerability. All Globus installations should be configured to disallow SSLv3. If you continue to experience this issue, it means that remote services must be upgraded - please contact your administrator and request that the endpoint be updated. What does "You are not an admin of the MyProxy Delegation Service" mean? If you are not using an OAuth server in your configuration (if you are using, for example, IdentityMethod = MyProxy in your configuration), you can disable the OAuth server by commenting out the Server = %(HOSTNAME)s line in the [OAuth] section of the configuration file. How do I fix Globus Connect Server file permission errors? The files in /var/lib/globus-connect-server/grid-security/certificates should all have permissions set to 644. What ports does Globus Connect Server need open? If you experience issues activating an endpoint, it’s often the case that one or more of the required ports is not open. Please see the Globus Connect Server Installation Guide for information on required open ports and configuring your firewall. How do I enable logging for Globus Connect Server 2.x.y? Currently, logging is not supported in Globus Connect Server >= 2.x.y. However, it can be enabled directly in GridFTP server, one of the Globus Connect Server components. Does Globus Connect Server require an X.509 certificate to be installed? If you install Globus Connect Server and select the MyProxy option, two components are installed: a GridFTP server and a MyProxy server. By default, certificates for both of these components are automatically installed so there is no need to add or configure X.509 certificates separately. You may choose to configure Globus Connect Server to use a certificate other than the default one installed. Please refer to the Globus Connect Server configuration section to see how that can be set up. If you install Globus Connect Server and select the MyProxy OAuth option, an additional component is installed, namely an OAuth server (either on an existing web server or as part of a new Apache server installation). In this instance, you will need a certificate to be installed on the Apache server and this certificate should be issued by a Certificate Authority (CA) that is automatically trusted by the browser. Can I use a different PAM module for authenticating users to Globus Connect Server endpoint? By default, Globus Connect Server uses the same PAM module as the login command on your server. If you would like to use a different PAM module for authenticating Globus users to the endpoint, you can edit the /var/lib/globus-connect-server/myproxy-server.conf file and modify the pam_id parameter. For example, you can set pam_id to "sshd" for it to use the same PAM module used by SSH. You can also create a completely new PAM configuration for Globus Connect Server use and place the file in /etc/pam.d/. Note that the /var/lib/globus-connect-server/myproxy-server.conf file is overwritten when you run a setup command execution, and you will need to manually update the file. I get the following error: "The Globus Connect Personal endpoint is not currently connected to Globus"
This message means that the Globus Connect Personal (GCP) software is not currently running on the workstation where it was installed. In order to perform transfers to or from a GCP endpoint, the GCP software needs to be running. This is different from activated. The user can see if GCP is running by looking for the Globus icon in the system tray, which is located on the bottom right of the screen. The Globus icon is a circle with the letter "g" in it. If the user does not see it, then GCP is not running and the user will get this error if he or she attempts to access their personal endpoint. If the GCP endpoint is not running, then the user can start it by running GCP from the Start menu. (Running Globus Connect section) "Both lights green indicate that Globus Connect Personal is running properly and is connected to Globus. The user may minimize or hide this status window once Globus Connect Personal has connected successfully." The user can see if GCP is running by looking for the Globus icon in the menu bar, which usually runs across the top of the screen. The Globus icon is a circle with the letter "g" in it. The user should see it in solid black, and not grayed out. If the user does not see that, then GCP is not running and he or she will get this error if they attempt to access their personal endpoint. If the GCP endpoint is not running, then the user can start it by running GCP from his or her Applications folder. How do I manage roles on my endpoint? The Globus web app provides an interface to manage roles on the endpoint on the Endpoints page. You can see a description of the supported roles here. Once you select your endpoint, you can choose the Roles tab to grant/revoke various roles on the endpoint. Note that your endpoint needs to be covered under a subscription as managed endpoint to be able to set roles on the endpoint. You can also use the Transfer API to manage roles on an endpoint. How do I convert an existing endpoint to a managed endpoint? To convert existing endpoints to managed endpoints, you can use the Web GUI and go to the Endpoints page under "administered by me", and select your endpoint. Then, under the Overview tab, select "Edit Attributes" and toggle the Managed Endpoint field to "Yes". Then click on the "Save Changes" tab on the bottom. Note:If you do not have this option then either 1) you do not own or administer the endpoint you are attempting to manage, or 2) you are not logged into the Globus website using a Subscription Manager account.